New Zealand’s land mass is primarily rural and therefore all drivers will, at some point, drive through the countryside. For new drivers and drivers visiting NZ, this article explains all of the hazards and situations you will occur driving around rural New Zealand. Metal (gravel) roads are still common. The more frequently used ones are graded regularly, but in rainy weather they can get ruts, corrugations and potholes very quickly. Ruts follow vehicle tracks. Tyres pick up dirt from the ruts, or splash it out along with muddy water, gradually deepening them. Eventually the ruts can become unpassable in a two-wheel drive car that sits on normal height suspension, although this isn’t common. 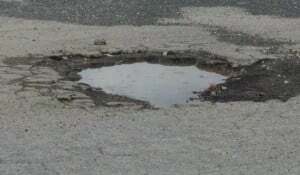 More common are larger potholes which can be damaging to suspension component and, if you are going fast, can risk flipping the vehicle over. Corrugations are a washboard of small ripples on the surface at right angles to the direction of travel. They are uncomfortable to drive over at any speed, but there’s usually a sweet spot where at a certain speed they will seem less severe. Our roads get a similar kind of corrugation as the Australian Outback, so you can check out this Mythbusters article for verification of this technique (opens in a new window). Potholes are large depressions in the road that put extreme load on your suspension and can cause punctures, suspension damage and even for your vehicle to flip if you are going fast enough and the hole is deep enough. If you are travelling at a slightly faster rate because of corrugations it’s safest to slow down for potholes if you can’t drive around them. On corners you will get a build-up of gravel on the outside of the bend which has way less grip. Try to follow the tyre tracks that are already in the gravel for the best grip. If you have to deviate from those tracks because of a vehicle approaching you, slow down because it’s extremely easy to understeer off the edge of the corner. In the wet, areas where the stones have been worn away leave hard-packed mud and this will be much more slippery. You are more at risk of having your windscreen cracked by a stone flung up from another vehicle on a gravel road. We’ve already mentioned the dangers of slippery mud on worn metal roads. Mud can also be introduced onto the road by agricultural machinery or minor landslips. Signage will warn you if an area if particularly prone to landslips, for example on the Thames Coast. If you are travelling through an area with crops planted then you can expect that at ploughing and harvest time tractors and harvesters will pull mud from the fields onto the road at gate entrances if it’s wet. Large agricultural vehicles such as combine harvesters and tractors are common on the roads at certain times of the year. They are often wider and slower than normal traffic, and they can drop mud onto the road. Double check you have enough room to pass. Most farmers are considerate and will ride close to the verge if possible. Stock trucks and milk container trucks can frequently be found on rural road, so be particularly vigilant on narrower roads. You will know if a route is a frequent milk truck route because you will see sharemilkers’ signs on farm gates indicating their number. For example, Fonterra signs are blue with a unique number. Also, if there are cows in fields around that area, there’s a chance it’s a dairy farm, and if not dairy, it’ll be a beef farm therefore stock trucks could be present. All large trucks are limited to 90kph. Logging is widespread and there are many areas where you might come across logging trucks on rural roads. Frequently logging roads are cut in from main roads therefore logging trucks are kept off rural roads that might be impassable for a long vehicle, but this won’t be the case all the time. Signage may indicate a heavy vehicle crossing point, particularly if there is forest either side of a road and vehicles might be crossing the road to get between them, or if large trucks frequently turn onto the road. New Zealand’s rail network is much less than what it was and many of the crossings are not controlled, particularly in rural areas. In all cases you should at least slow down and be prepared to stop. If there are stop signs at the crossing then you must stop. Read our article here about level crossings and what to expect (opens in a new window). In some areas you might find livestock on the road. New Zealand predominantly deals with cows and sheep therefore, apart from the odd alpaca, ostrich or horse, you are unlikely to run into anything large on the road other than a deer. With possums and (to a lesser extent feral pigs and goats), it’s generally better to hit them rather than try to swerve around them because of the dangers of swerving, even though you might cause damage to your car. In the case of a deer, there’s a risk it could come through your windscreen if you hit it. Some areas, for example the Waikato plains west of Thames, are particularly prone to fog. 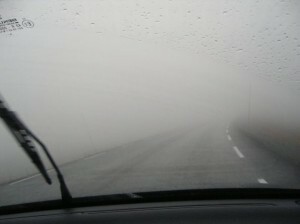 It can reduce your visibility to less than 20 metres. On rural roads there are less visual cues such as road studs (cats eyes), lines and lights, and less traffic to follow, so you will need to slow down. Don’t brake suddenly if a car is following you as they will not have as much reaction time. If you need to pull over and stop, pull off the road as far as you can and keep your lights on. You should have your fog lights on, and your headlights on low beam because high beam reflects too much light back into your face. Snow in the South Island will be heavy in places and rural roads often don’t get cleared frequently, if at all. Carry snow chains and prepare for having to turn back if you can’t reach your destination. There are large areas that have very restricted cellphone coverage in New Zealand. If you are heading into one of those areas, make sure you’ve let someone know where you are. You can purchase an antenna kit for your vehicle and that will give you greater coverage. Check this map for coverage by Telecom and here for Vodafone. In some areas stock might be controlled by gates or cattle grids. Be sure to close all stock gates behind you. Cattle grids can be extremely slippery in cold weather, and also can damage your vehicle if they are damaged. Drive carefully over them. There are a few places where there is not a fuel stop for a couple of hundred kilometres, so don’t let your fuel get too low. This is especially applicable at night where many rural petrol stations are not open 24/7. Locals will have a much better knowledge of the roads than you and will often drive fast. If you are not aware of this, you could develop a false sense of security that could cause you to take a corner too fast. If you are new to an area you are likely to have local drivers on your tail wanting to overtake. Let them overtake. Washouts are very common particular in gorges, hill country and where a road runs along a shore with steep hills behind it, for example the Thames-Coromandel road. This is where an area of the edge of the road has washed away. The road close to the edge will be unstable. Heavy rain exacerbates washouts. While washouts are when material subsides from the road, narrowing the road or, at minimum, destabilising its edges, landslips leave debris across the road. On dark rural roads, seeing a landslip is extremely difficult. If you see warning signs that landslips are possible, and it has been raining heavily, reduce your speed as you could easily come around a corner and hit a pile of rubble which could flip your vehicle. Even on State Highways street lighting can be infrequent. Rural roads will have very little in the way of street lighting, and often no marked centre line or edge lines. Take it easy at night if you’re not sure which way the road turns. On narrow roads you will have less margin of error with vehicles coming towards you. You may have to pull over to let a vehicle past, however, long, coarse kaikouia grass on the verges can look flat, but could hide steep drops. It’s sometimes safer to reverse up the road a little to find somewhere safer to pull over. It’s important to take it slower around corners because your braking performance will be compromised if you have to stop suddenly and you are turning. This is because more weight will be on the outside wheel as you are turning the corner, and it will take you longer to stop, and you could end up understeering off the corner. There will be fewer signs telling you where you are going and what the road’s direction or condition is. There might be a generic sign that says the road is winding for a certain number of kilometres, but you won’t necessarily know which way each turn goes. You are more likely to encounter horses being ridden on the road in a rural area. Take care around horses – give them a wide berth, drive slowly past, and don’t use your horn or you might startle them which could throw the rider into the path of traffic. Cyclists won’t be protected by cycle lanes, and if the road is narrower already there will be less room to overtake. Walkers will be more exposed if there are not footpaths. Walkers at night might not be very visible on dark country lanes. There are many beach roads in New Zealand. Be careful of the tide, and getting bogged down. 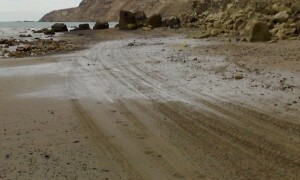 It’s not advisable to use a two-wheel drive vehicle on beach roads.